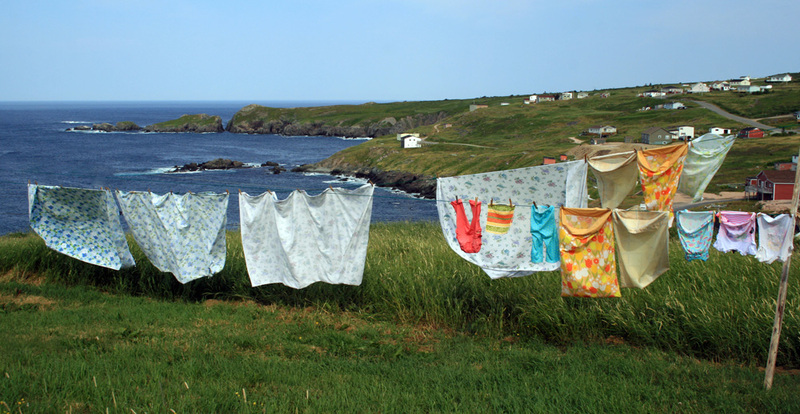 Our family usually spends Labour Day weekend (and plenty of other time) in beautiful Grate’s Cove, at the northern tip of Newfoundland’s Avalon Peninsula. It is my mother-in-law’s childhood home and she still owns the old family house, which is nestled in the heart of this quaint, historic village and overlooks the stunning little harbour. 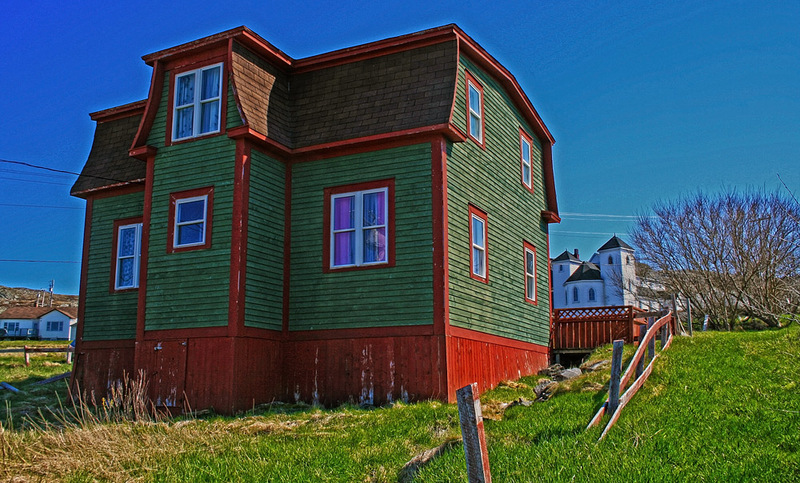 Grates Cove is a beautiful and endearing little community. Nestled at the very northern tip of the Avalon Peninsula, its stark beauty and incredible vista make it a hit with anyone lucky enough to visit! My wife’s family owns a century old house overlooking the harbour in Grate’s Cove, and we spend time there every summer and fall. 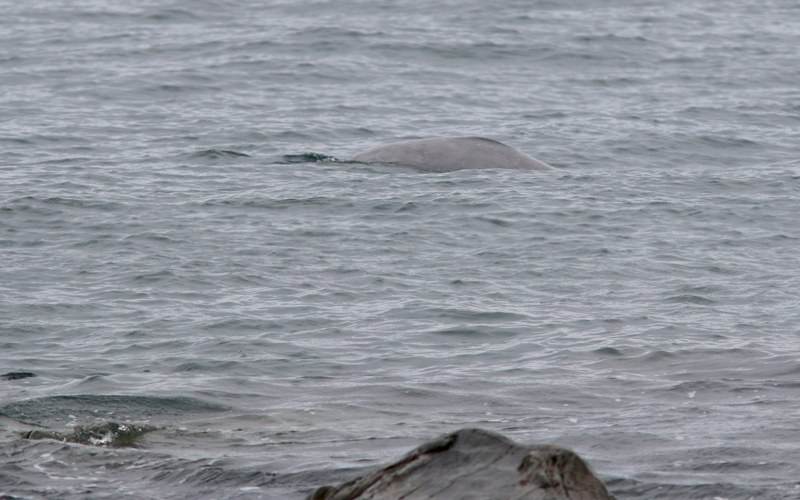 And yes – I was even able to watch the Beluga while having a coffee at the kitchen table! It was almost dusk when I arrived at Grate’s Cove Thursday evening, but I had a quick scan over the harbour before heading into the house. There was no sign, and I had a sinking feeling that I might have missed my chance (at this point, I hadn’t heard any reports for a few days). The next morning I scoured the harbour from our upstairs window with the same result, and was just expressing my disappointment to Susan when I spotted it surfacing in “the gulch”. My spirits soared, and I skipped breakfast to go get better looks. I spent most of the next four hours watching as it swam, surfaced and sometimes (though rarely) spy-hopped or lunged out of the water. Much of the time it seemed intent on swimming in increasingly tight circles and then diving for minutes at a time – presumably it was corralling and feeding on fish (likely herring, which reportedly have been abundant in the cove lately). My family joined me to enjoy this rare visitor for a while – scrambling over the breakwater and a rocky point to get better looks. 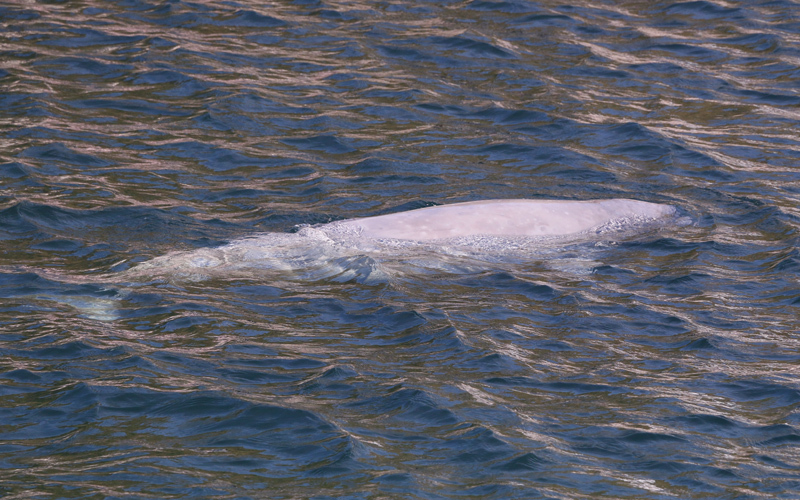 My first views of the Beluga Whale were over the breakwater that protects the community wharf, as it swam around in the nearby “gulch”. I eventually climbed out to a rocky point where I could enjoy a closer vantage point. 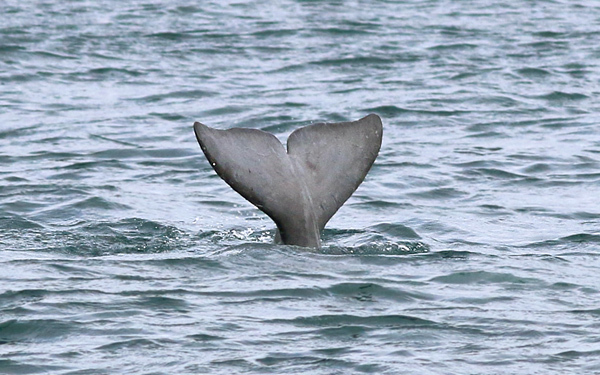 Like most whales, more than 90% of my views (and photos) were of the back as it surfaced to breathe. 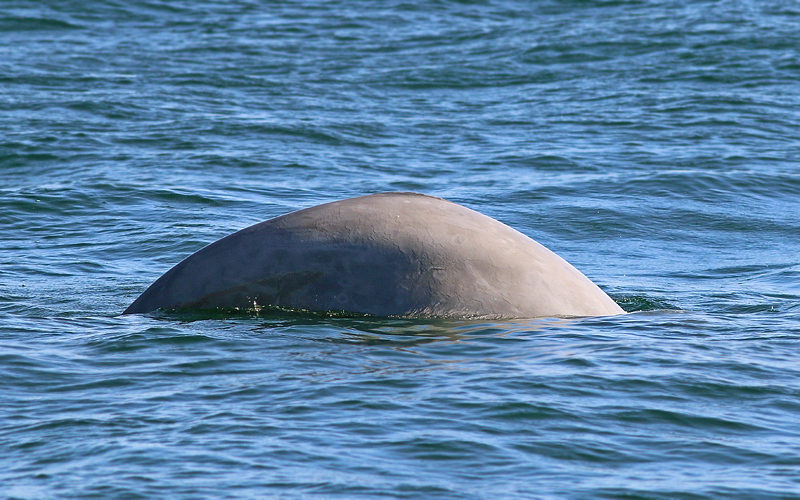 When acting like this, the lack of a dorsal fin helps distinguish a Beluga from similar sized dolphins and porpoises. Beluga Whales have a lifespan of 35-50 years. 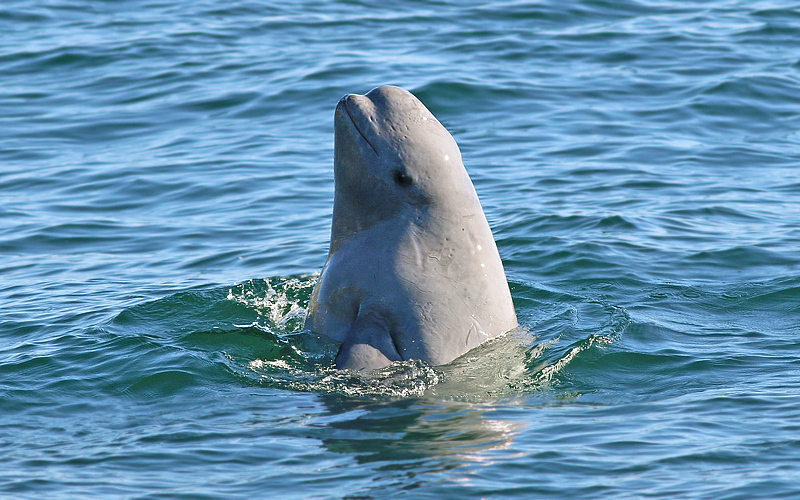 Young Belugas start out dark grey and gradually lighten, becoming white when they reach maturity at about age five. 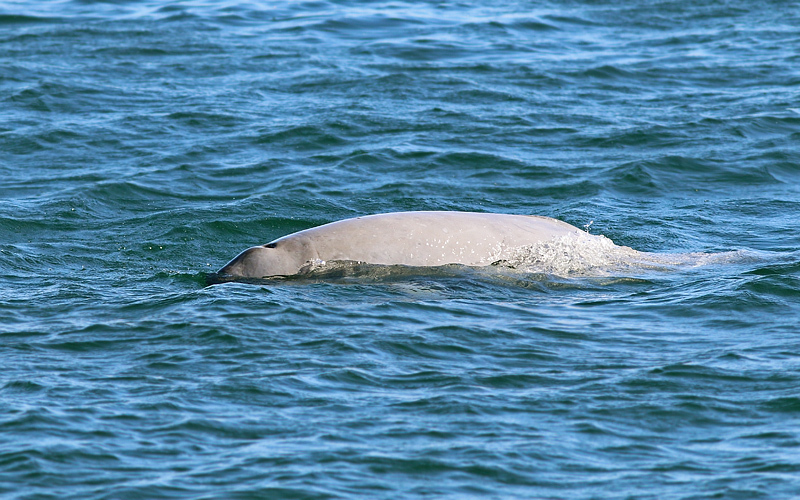 The light grey colour of this individual suggests it is a young whale of maybe 3-4 years old. Occasionally, this young whale got playful and I saw it spy-hopping several times … It took several hours of watching and waiting to finally get some “action shots”, especially since you could never anticipate when or where it might decide to stick its head out of the water. Patience (and a lot of practice with my camera) pays off! Here I am … catch me if you can! 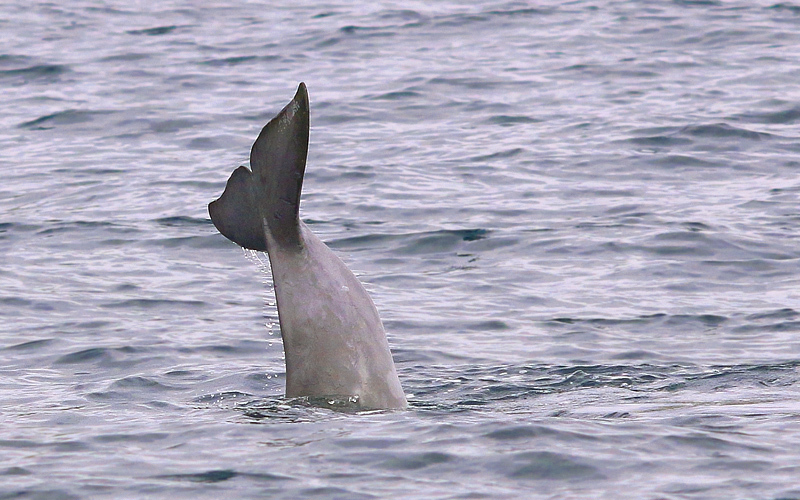 Beluga rarely have to expose their tails, even when diving, but I did enjoy the very times it decided to do a little tail-lobbing. 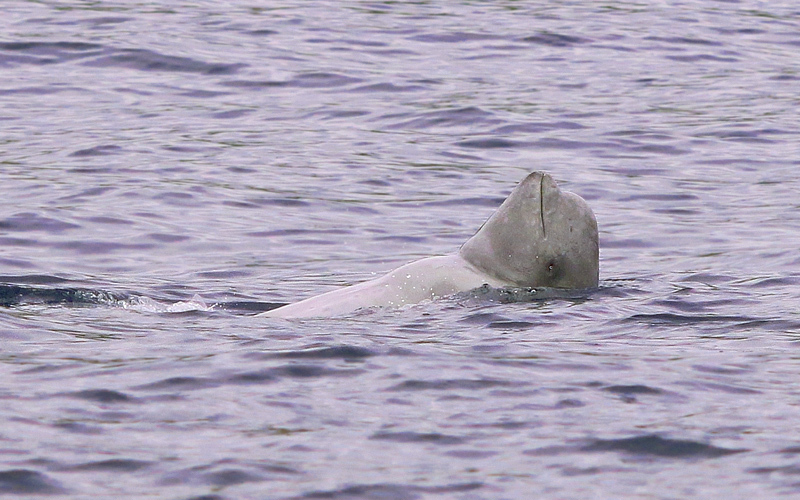 Apparently Beluga Whales can even do the backstroke! 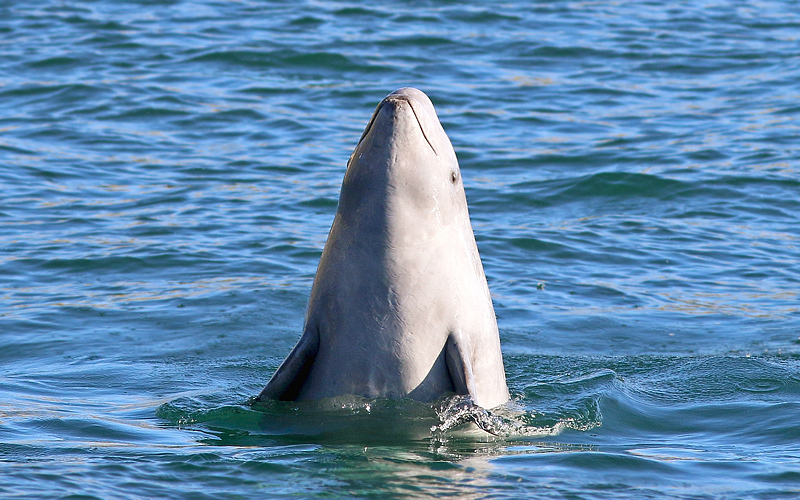 Unlike other whales (but similar to dolphins), Belugas have flexible necks which allow them to turn their heads in multiple directions. A few birds, including this Red-necked Phalarope, tried to distract me – but it was hard to look at anything but that beautiful whale! Later I heard that the Beluga had come right in to the wharf and entertained some onlookers at very close range … something it hadn’t done during the morning or early afternoon. I struck out earlier on Saturday morning, spotting my new friend at its familiar spot on the other side of the breakwater. After an hour or so, it disappeared – so I headed back to the wharf and sure enough, there it was swimming in the shallow water. It spent a lot of time at the bottom, where I could see it digging with its snout and, at times, “playing” with a pump hose that was dangling there. My family had spotted me from the house and were soon by my side, the kids (my daughters, nephews and niece) especially enjoying the whale as it swam just metres away. 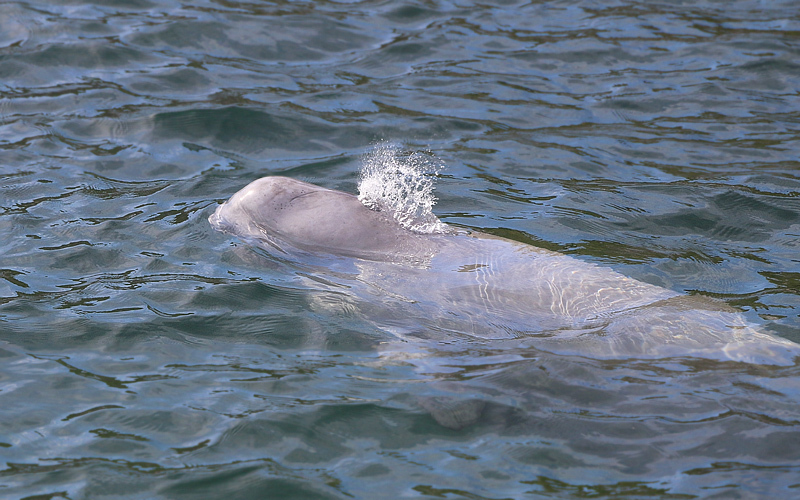 When swimming near the wharf, it was easier to appreciate the full shape and size of this young Beluga. It seemed to be ~8 feet in length, which is only half the size of a full grown adult male. 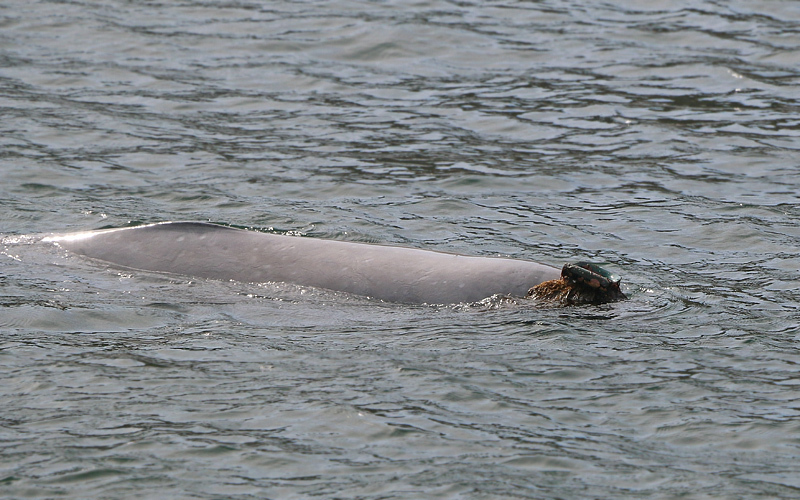 A few small scars were already visible on this young animal – including one on its head (seen here) and a longer one on its left flank behind the flipper. 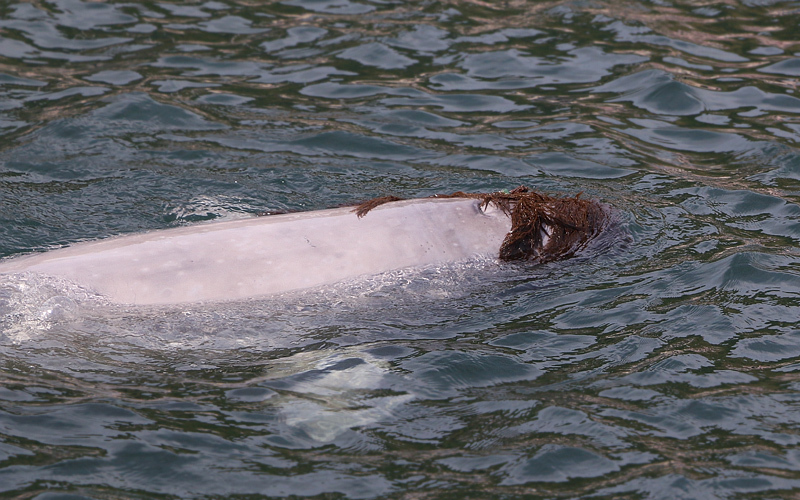 Because of their innate curiosity, one of the biggest dangers to Beluga Whales are injury and death from boat propellers as they approach to investigate. People interacting with these very social animals often, unwittingly, lead to more such unfortunate encounters. I hope this whale avoids such a sad fate. We soon discovered its playful nature, as it grabbed a short piece of rope that was floating on the surface and pushed it with its snout all around the area. Often times it went to the bottom and came up with a piece of seaweed on its head, trying to balance it as it swam around, and retrieving it when it fell off! I’m not sure if it was trying to entertain itself or us. 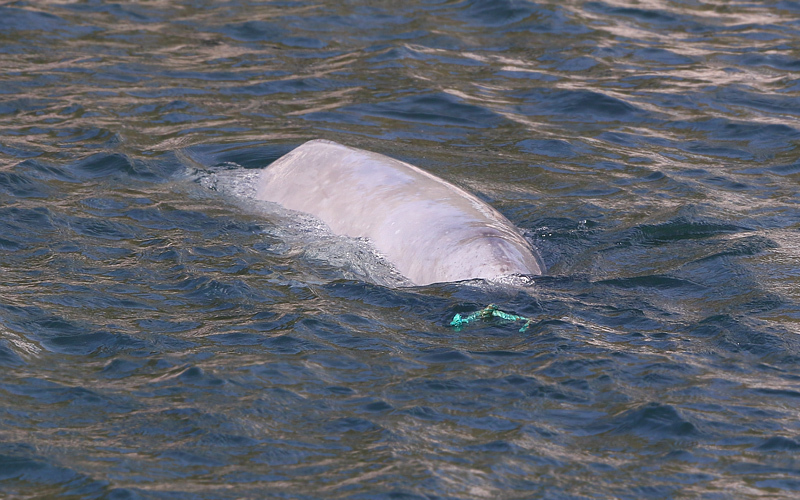 A small length of rope floating near the wharf provided several minutes of entertainment for this young Beluga. Perhaps the most fun was watching the whale balance pieces of kelp on its head … there was an obvious air of playfulness about this animal. It would collect kelp from the bottom and bring it to surface, making a real game of trying to keep it on its head for as long as possible and retrieving it when it fell off. This wonderful little whale had apparently been featured on local news several times in the past few days, so a number of curious onlookers and visitors arrived at the wharf during the day on Saturday … some of them treated to close looks while it played around the wharf, and others having to settle for slightly more distant looks as it hung out in the gulch on the other side (presumably where it feeds). A group of divers even showed up and were able to enjoy a great underwater visit with the whale, which seemed to appreciate the company. We also enjoyed a couple great visits with our friends at Grate’s Cove Studios – an wonderful restaurant with excellent food that is a unique mix of Newfoundland & Cajun cuisine. If you’ve never been, I suggest you go – it’s a great excuse to visit Grate’s Cove – rare whale or not! I went back to say good-bye to the little Beluga on Sunday morning before hitting the road back to St. John’s, although my family who were able to stay a little longer were treated to another wharf-side visit later in the day. What a wonderful addition to another great holiday weekend! 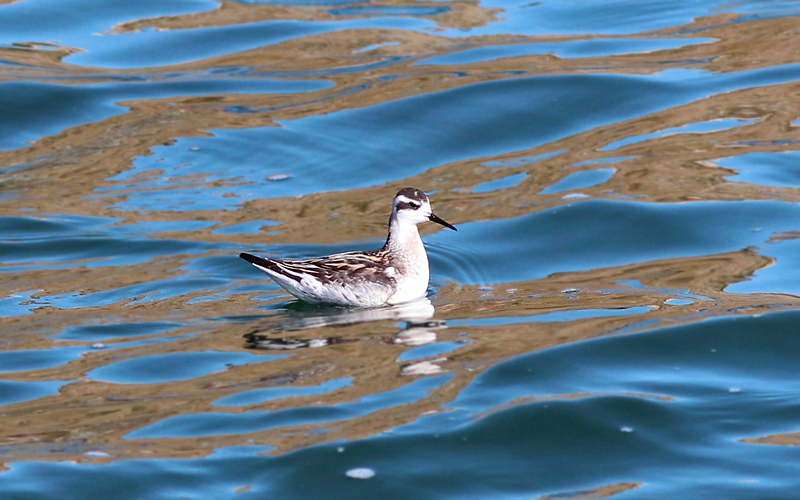 This entry was posted in Marine Mammals, Newfoundland birds, Photography and tagged Beluga Whale, Grate's Cove, Marine Mammal, Newfoundland, Photography, Red-necked Phalarope, whales. Bookmark the permalink. Wow magical experience thanks for sharing . The spyhopping photos are awesome. Thanks! It took a lot of patience and focus to get those spy-hopping photos, but it was a great excuse to spend more time with this wonderful animal! How cool is that! I will be visiting New Foundland next June, I have been following your blogs, so much fun to see all the beautiful birds flowers and whales. I can’t wait til I get there. Thanks for sharing your blogs and photos!!! Wonderful that you’ll be visiting! No doubt you’ll have a great time and will enjoy plenty of beautiful birds, flowers and whales. Let me know if you need any help planning your trip. I watch him every day too, from the wharf, looking down from the hill and occasionally from my own deck or window in the Blue House at the end of the road, ‘on the edge’ overlooking the Atlantic in The Grates. He’s beautiful, and above alI I hope he has a safe journey home after giving so many people so much joy this summer. You are blessed to live in such an amazing place as Grate’s Cove … we love our time there, and of course it is very special to Susan (my wife). Having a unique visitor like this young Beluga is just one of the many amazing experiences I’ve had there. My Father was born and raised in “The Grates” a place we all love so much. He would be so happy to hear this about the little Beluga and he would want updates daily. When I heard about I thought “Oh wow I must tell Dad. Then my heart sank . Dad had passed away in Jan of this year and now I guess he can see it from another angle. Thanks so much for sharing your story. The pictures are awesome. I’m in love with your house, the pictures, the beluga… And starting to become jealous soon. Jennifer sent me over, so glad she did. I watched Orca whales here in Australia yesterday, they were breaching but to far for my camera to capture. Love your playful photos.